A perfect addition to savoury salads, roast meats or add a festive - salty - touch to brownies, cookies or cakes. The bright red (very natural) colour of the pomegranate is perfect for the Christmas season. If salty is not on your palate, this recipe can be done to create 'pomegranate sugar sprinkles' using crystal sugar instead of salt flakes. 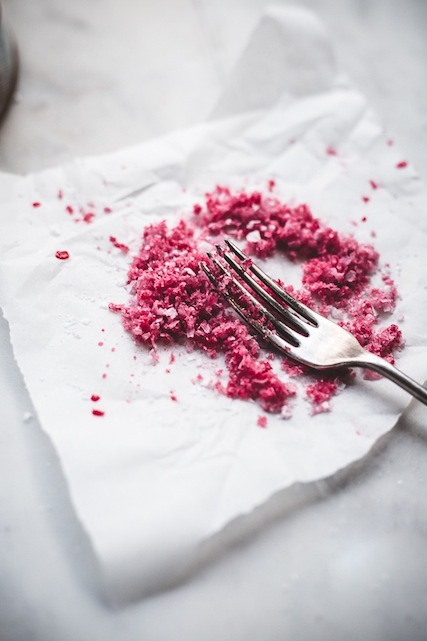 Use a spoon or pastry brush to splatter a piece of parchment paper with a little pomegranate juice. Sprinkle a few table spoons of salt over parchment paper and use a fork to gently stir. Splash on a bit more pomegranate juice if needed. Stir until all the salt is coated. Spread out out carefully over the piece of parchment paper and leave to dry.